CalPERS is doing everything it can to put its finger on the scale of the upcoming board election to prop up Board President Priya Mathur over the pro-transparency, pro-reform challenger Jason Perez. This blog became a part of a clear-cut case of CalPERS impermissibly throwing its institutional weight behind the recidivist disclosure-flouting Mathur. 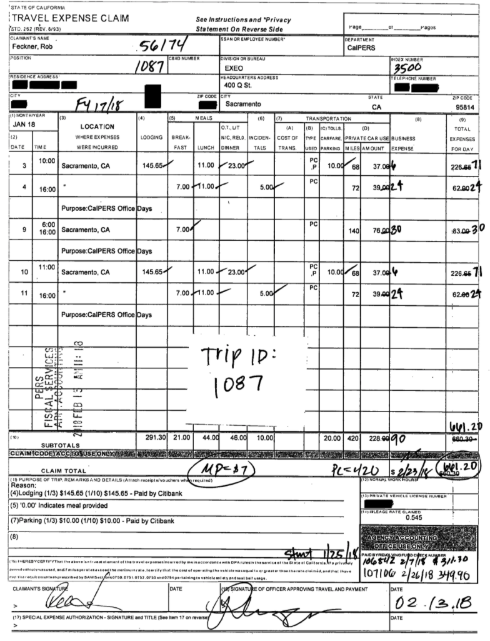 CalPERS repeatedly pushed back the delivery of the records so as to make sure Perez would not be able to prove that Mathur had approved of and participated in the eye-popping practice of having board members pre-sign undated expense forms in blank, in particular the Travel Expense Claim form, STD 262a. Perez had wanted to include this critical information about Mathur having participated in the criminal practice of submitting a false account in his ballot statement which is sent to all eligible voters. The ballot statement is far and away the most important communication in CalPERS elections. The reason the Travel Expense Claim form abuse matters isn’t simply that it is a flagrant violation of state rules, as well as of board member fiduciary duty. Allowing third parties to have possession of pre-signed, undated forms allows for all sorts of misconduct, such as embezzlement and extortion of board members. Hence calling it out was a simple way to demonstrate Mathur was unfit for office. However, CalPERS enabled Mathur to block Perez from including this key bit of information from his ballot statement by making sure Perez did not get the evidence in time to present to the administrative law judge ruling on Mathur’s protests to his statement. However, there is still some justice in this world. Even with Mathur having prevailed on the pre-signing of Travel Expense Claim forms on false grounds, she lost on five objections she raised and on another four, only got minor wording changes that do not appear to have helped her very much. The resulting Perez ballot statement, which we have embedded at the end of this post, is still brutal. The Board Services Unit, which reports to the Board President, asks board members to pre-sign blank sheets of paper with just a blank signature line printed on them. The Board Services Unit later prints onto that signed blank page the body of the travel claim form, with the dollar amounts and date filled in, and submits it on board members’ behalf. Importantly, the form that CalPERS board members have been endorsing in blank requires the signature to certify a statement contained immediately above the signature that validates the accuracy of the information submitted on of the form. As you can see in one of the photos below, that certification is deliberately omitted from the nearly blank page that the board members sign in advance. That means the Board Services Unit, the Board President as their supervisor, and the board members pre-signing these forms are systematically producing false documents. This practice is a prescription for fraud. The board members who autograph these pieces of paper are knowingly allowing other individuals to present cobbled-together travel expense forms illegally, as bona fide originals. Under the California Government Code, this is considered to be providing a false account, a form of misappropriation of funds. That is a crime pursuant to Penal Code 424(a)(3). At their orientation meeting, new board members Margaret Brown and David Miller had been presented with roughly 20 copies of the form and were asked to sign and turn them in right there. Neither of them submitted undated, pre-signed Travel Expense Claim forms. Recall that board member Margaret Brown had raised her concerns about the signing-in-blank policy on January 25 in an e-mail to Mathur. 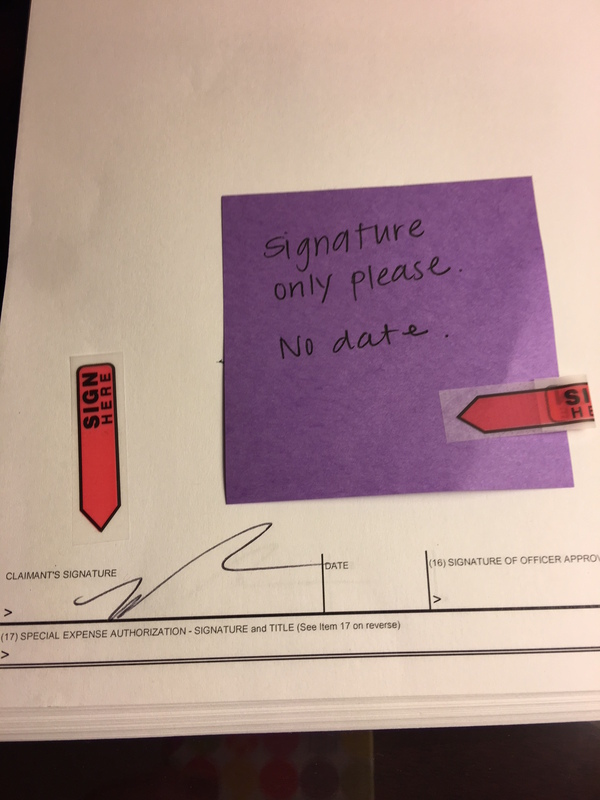 As the images show, the Board Services Unit instructs board members to sign undated forms in blank, with the body of the form, including critically, the certification language removed. Staff prints the rest of the form, including the missing certification language, into the pre-signed document when they also fill in expense information and submit it on behalf of the board member. 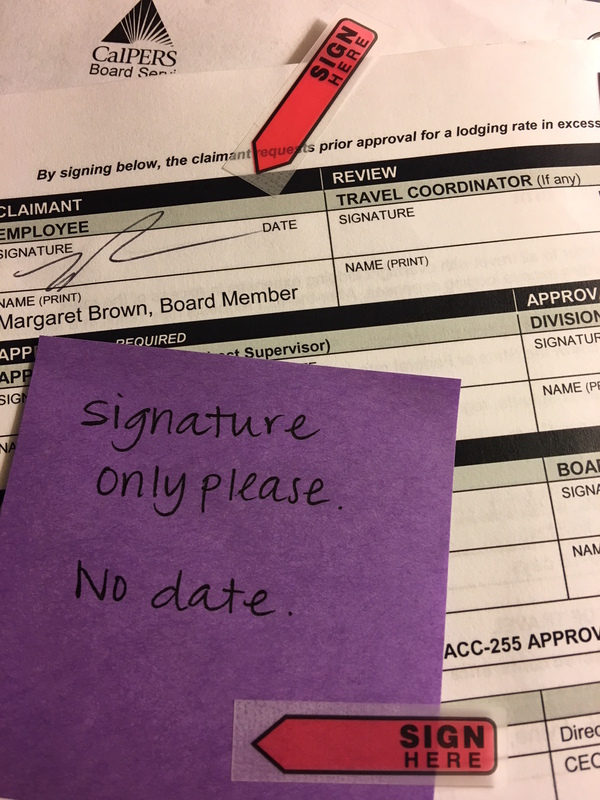 The day before we published the post outing this practice, we submitted a Public Records Act request on May 9 seeking all Travel Expense Claim forms completed and submitted by board members from January 1, 2017 through May 9, 2018, as well as the e-mail correspondence with board members approving expenses submitted on pre-signed forms. Perez filed his nomination petition, which included his candidate statement, on May 16. On June 18, both Perez and Mathur submitted letters contesting the accuracy of some parts of their opponent’s candidate statement and requesting a hearing before an arbitrator. One of the Perez’s statements that Mathur challenged was “As board president, Mathur has approved the process for obtaining signatures on blank State forms authorizing payments, likely a criminal act.” As you can see in the embedded document at the end of this post, one of many examples I eventually received, that statement was correct. This one shows Mathur approving an expense claim pre-signed by Rob Feckner. There were also pre-signed claims by Michael Bilbrey and Dana Hollinger signed by Mathur. Even worse, the Public Records Act response included a blank unsigned Travel Expense Claim form attached to an e-mail, showing the potential for it to be widely circulated and abused. 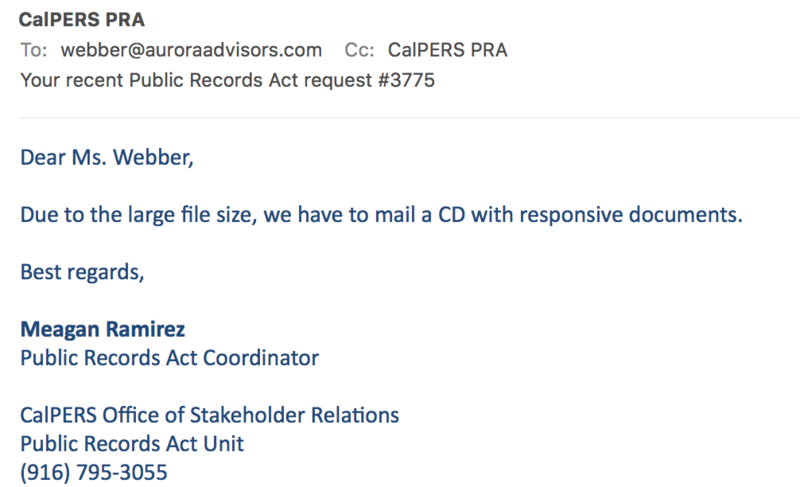 On June 22, CalPERS notified me that they were now going to produce “all responsive documents” on July 31. By happenstance (or not?) this turns out to be the date scheduled for the evidentiary hearing on Mathur’s objections to Perez’s statement. But now the story gets more complicated, and in the process proves that CalPERS holding back the records was no accident. Perez’s lawyer appealed to the administrative law judge for the chance to participate in the arbitration hearing, throwing himself on the mercy of the court. So now it looked like Perez would have the opportunity to use the results from my Public Records Act request to include in his filing, correct? Think again. As you can see from the document embedded at the end of this post, the claim that the Public Records Act response was not ready was false. The cover letters are the very last thing to be prepared in the Public Records Act process. The cover letter was dated July 31, showing that the response was ready on July 31 and there was no legitimate reason for delaying its release until August 3. CalPERS is trying to damage control for Mathur’s misrule as Board President. But as you can see from the final version of Perez’s candidate statement, which is to be mailed to eligible voters on August 31, even with the omission of this damning item, the statement is still deadly. It is hard to see how anyone who reads this could vote for Mathur. As you may know, the Public Records Act (“PRA”) provides that agencies “shall make . . . records promptly available.” Gov’t. Code § 6253(b). The PRA further provides that agencies “shall, within 10 days from receipt of the request, determine whether the request, in whole or in part, seeks copies of disclosable public records in the possession of the agency and shall promptly notify the person making the request of the determination and the reasons therefor.” Gov’t. Code § 6253(c). 2 Note that Perez was not dependent upon me to obtain the records; any member of the public can ask for a copy of an existing Public Records Act response. But he was not likely to receive them soon enough for the arbitration this way. Your humble blogger did not review or comment on Perez’s ballot statement or his addenbum, nor have I had any contact with him, his campaign manager, or his attorney regarding this dispute or his campaign generally. I did meet Perez and his campaign manager Donna Snodgrass at the CalPERS offsite in July but we did not discuss his campaign. Given that I had heard through the grapevine that whether Mathur had signed the blank expense forms was a contested issue, I had planned to post promptly if the Public Records Act response showed that she had. 3 And that is before you get to the fact that I have difficultly signing for them and building staff are not allowed to sign for them. 4 The judge is to be credited for scheduling the evidentiary hearing for July 31 despite the lack of apparent objection in the form of a Notice of Participation from Perez. Apparently he wanted to review Mathur’s documentation and not merely rubber stamp her requests. 5 Perez’s side understood that they would not be able to introduce new evidence at this hearing, only cross examine any witnesses Mathur had testify. This entry was posted in Banana republic, CalPERS, Politics, Ridiculously obvious scams on August 20, 2018 by Yves Smith. Now, I hope people do read those statements, and not just vote for someone because they were there.. Mathur needs to go. Which reminds me – maybe NC readers who happen to know any CalPERS beneficiaries could mail them Yves’s efforts? Attorney General Becerra is gonna be all over this! Well, when he’s done impeaching Trump, unless something more important comes up. If I was CalPERS , the thought of having a serving police sergeant on the Board would make me very nervous. There would be a lot of unhappy policemen if things started to happen to their pensions too and last time I looked, all of them have access to guns. Looking over Perez’s website (http://www.jasonperezforcalpers.com/index.html), it looks like he is not pulling his punches either and I bet he is getting a lot of support form his fellow officers. And if CalPERS is putting their meaty fist on the scales of the upcoming election, would that not make it likely that the election result may end up in court? Having pre-signed, undated, blank Travel Expense Claim forms is not only wrong but it is so blatantly stupid as well. And the sloppiness in replying to Yves’s request seems to show a side not used to be challenged. Maybe, just maybe, with CalPERS the changes will be like going broke. First slowly, and then rapidly. By the way. Anybody know if bunco squads are still a thing? As one of the officers that works for him, I can tell you that he operates under the utmost integrity and truly looks out for his people selflessly. He is relentless when it comes to pursuing what is right and will fight until the end for it! Thanks, Yves. Very helpful information. Keep up the good work. I know who I’m voting for. I’ll pass this on to others. The most interesting thing about CalPERS’ behavior is how clumsy and blatant they are. You might even think that they were just plain stupid. What on earth is the “Office of Stakeholder Relations”? Are the pensioners the stakeholders here? If so, you’d think Mr. Teykaerts position is unnecessary. How much does that bureaucracy within a bureaucracy cost? And when it comes to disclosusres, don’t “interests” under the PRA have to be defined (“…when the interests served by not disclosing the records clearly outweigh the interests served by disclosure.”) I would think that all disclosures should be made public all the time. Creepy. And per Perez’s statement, why on earth doesn’t CalPERS have more bargaining power against medical insurance premium increases? That’s a disgrace. No wonder CalPERS think they need a white-collar criminal defense attorney as their General Counsel. The under-funding theater of “Mr Market hazz a sad” may work on SEIU and AFSCME, but current and retired law enforcement folks can apparently smell a rat — and even if successive Democrat Attorneys General Brown, Harris, and Becerra have looked the other way, the cops have tools at their disposal other than guns and Tasers. Investment “losses” like the half-billion dollar CatchMark forestry fiasco earlier reported on this blog don’t look kosher. The U.S. DOJ indicted the now-imprisoned former CEO and his ex-board member crony. You have to wonder what Jeff Sessions might think about giving California Dems a black eye over CalPERS. It comes as no surprise that staff are setting-up oversight-board members for blackmail, foot-dragging on PRA’s, and rigging elections in order to perpetuate the cover-up. Expect today’s reporting to cause them to double-down on their bad behavior, not to desist from it. It’s no longer surprising the lengths CalPERS will go. But I think you may have missed something Yves. I took a close look at the signatures on the form. Rob Feckner’s signature looks like my mother’s handwriting. I don’t want to degrade my gender by stating that men can’t have excellent penmanship, but it looks feminine to me. Any expert graphologist readers? I know of multiple current members who never received election ballots and wonder if that was accidental or pervasive. It also is a bit surprising the lack of ballots received per the board election page, though I am unsure of the typical ballot responses submitted in historical elections to truly be certain of that.